When I baked a Naan sometime back, I realized that I actually make the Naans couple of ways. So thought that recording all the different ways to make a naan will be interesting. If you have been reading this blog you may know that I am great fan of Naan and Paneer Butter Masala. This is what I order each time I eat at a restaurant. I don't think I can ever get bored of the duo or the different versions I can count that I have enjoyed by now. I think I started making Nan at home almost ever since I started baking Pizzas. Since we don't have a tandoori oven, it was naturally that I had to find an alternate method. I have been making on the Pressure cooker bottom or even the tilted tawa method for over a decade now. And what's surprising is the fact that the Naan dough is almost the same as Pizza dough or at least that's how I have been making it. Wonder how the best dishes I like are almost the same. Anyway I used to enjoy the feedback my Naans used to get and one particular conversation comes to mind. 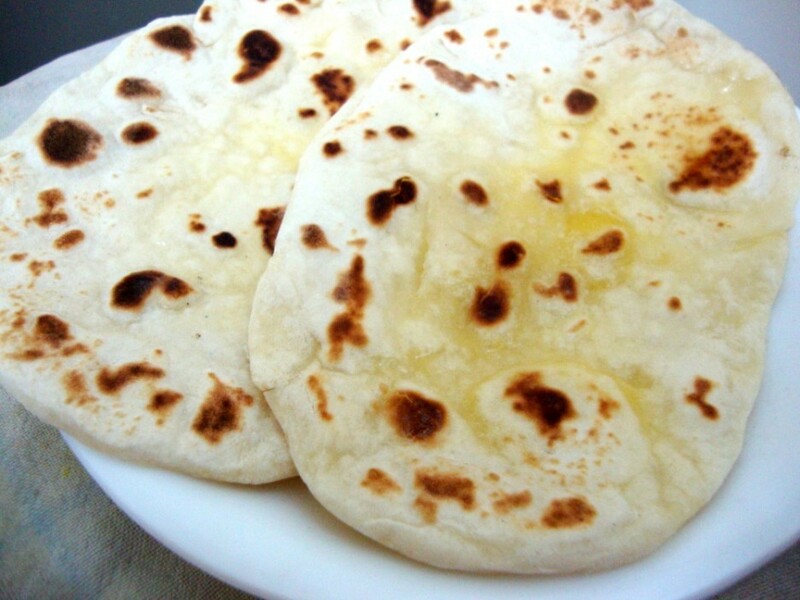 It was during dining in our club restaurant when the waiter happen to mention that their Naans come out best and nobody can replicate it at home. Konda immediate response was that I make yummier Naans and Paneer Butter Masala. He was not ready to accept and said Naan would require egg to be added for the soft texture to come etc, knowing well that I don't eat egg. Anyway I said I didn't want to argue on whose recipe is best. I would rather enjoy their restaurant Naans myself. When I think of the recipe, I keep changing the ingredients myself most times. I have used curds, butter, milk at varying proportions to get the best texture. Each it does turn out very well. So I guess it depends on how and when you make it. And this is the third method! Cook on one side, you will see the naan puffing up. See how nicely it has puffed up! Flip to the other side and continue cooking. Turn over again and remove. 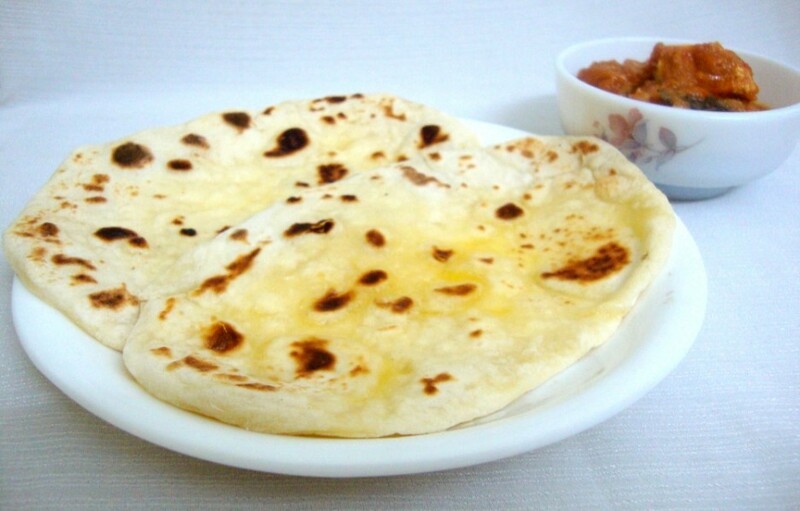 Smear butter right away on the hot Naan. Take the yeast in a cup; add the sugar and warm water. Cover with lid. After 10 minutes you will see all frothy texture on the top, don’t disturb. Keep it aside. This shows that yeast is still active. In a wide bowl, take the flour, add the yeast mix. Then add the salt. butter and curds. Crumble well. Slowly knead to soft pliable dough using water as required. Punch it well for couple of minutes. Cover with a wet muslin cloth and keep it in a warm place for 1 -2 hrs. Once done, remove the cover, punch it down again. 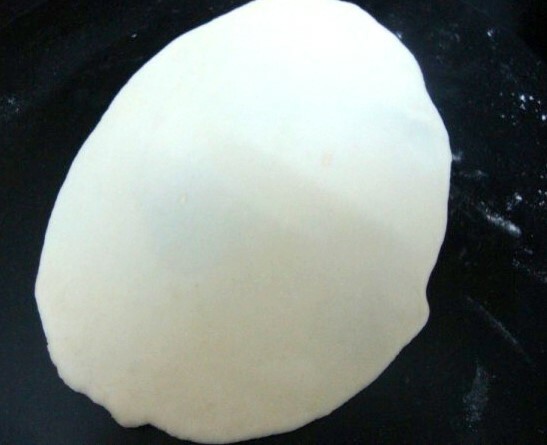 For making on tawa you need not wait for 2 hrs, the dough gets ready by 30 - 40 mins max. 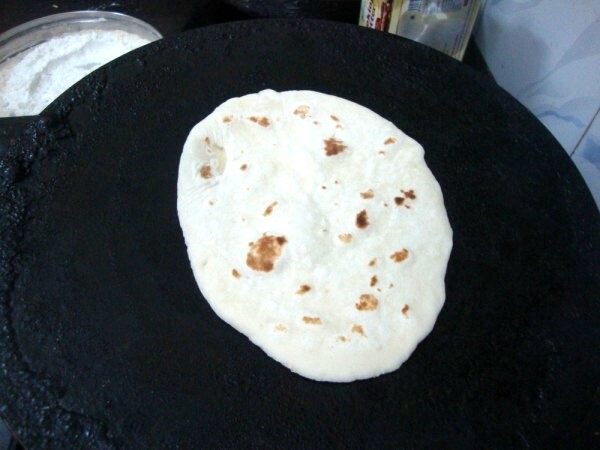 When you are ready to make, get the tawa on stove. Divide the dough into small balls, dust it in flour. Roll them into oval shapes. Make couple of them all rolled out by the time the tawa gets heated up. 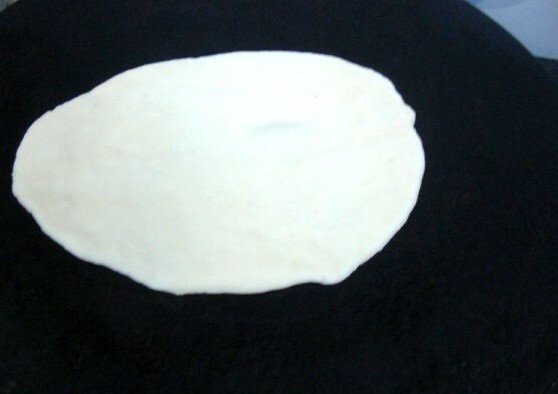 Place the rolled out Naan on the tawa. Cook on high flame. You will see the Naan puffing up. Gently flip to the other side. The Naan puffs up on both sides. Remove and quickly apply butter over the top. 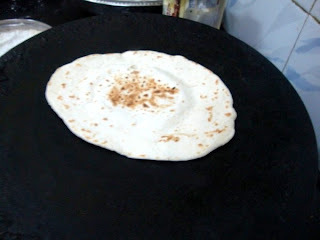 Note: It is enough to cook on the tawa for the naan to be done well. 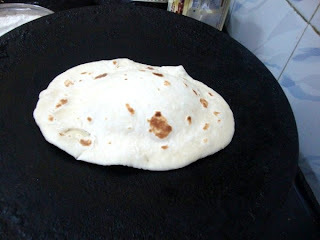 If you want those classic black spots on the top, you can put the cooked naans on direct flame using a tong. 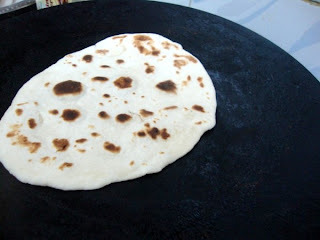 This way your naan will have those traditional brown/black spots on top.